Great 8-person Apartment with 3 bedrooms and 2 bathrooms. 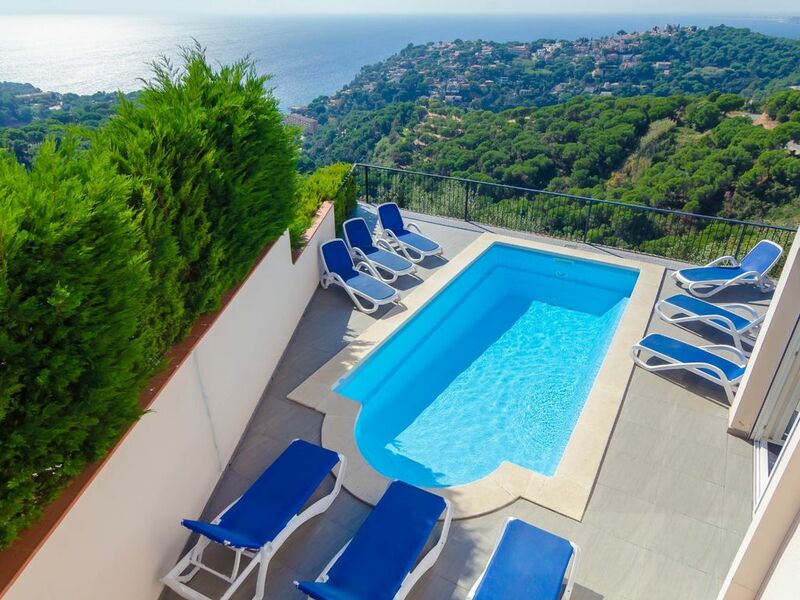 Of course it also has a private pool, free Wi-Fi and a gorgeous sun terrace with view over the Mediterranean Sea. Would you like an unforgettable holiday in Spain? Then book this fantastic holiday Apartment! Mirabelle offers you everything you need for a stay with a group of 8. The villa is located down a quiet street and the car can easily be parked down this street. Downstairs you will find an open kitchen, a living room with TV and stereo, 3 bedrooms and another 2 bathrooms. The interior or bright, modern and comfortable, you will feel right at home. The living room has a very comfortable corner in which you can recover in the evening from all the day's adventures. Next to the living room is a spacious terrace, from which you can access the swimming pool. Around the villa is everything you need to enjoy the Spanish sun with your friends or family. Fantastic lounge chairs, plenty of garden furniture and of course a barbecue for all that delicious Catalan meat. You will have a truly fantastic private swimming pool with great view of the azure blue Mediterranean Sea. You can share your holiday pictures with your friends back home straight away, because this villa has free Wi-Fi! Guests of Mirabelle have never been bored along the Costa Brava, so book soon! No other place offers so much in the way of activities as Lloret de Mar! This is an ideal place to spend your holiday. With Apartment Mirabelle as your home base you don't need to miss anything of all the holiday fun. At night you can let your hair down in one of the many famous clubs, such as Bumpers, St Trop and Moef Gaga. During the day you relax under the sun on one of the beaches, located only 3 km from your apartment, where you can dive into the blue waves of the Mediterranean every so often. Fancy something else? Go bungee jumping! Water world has one of the tallest bungee towers in the world! For the real daredevil there is Scad diving, which is bungee jumping without the rope! That's right; instead you are caught by a large net. Fancy a day trip? Cities such as Barcelona and Girona are nearby, you can even catch a bus from Lloret de Mar. There's enough to see and discover, fun boutiques, surprisingly fun excursions, many restaurants and fun cafes. Lots to do and all so close to your own holiday villa! Großes Haus mit super Ausblick! Riesengroßes Haus mit kleinem Pool und mega Ausblick auf das Meer und die umliegenden Orte.